This novel arrived right about the time my husband and I were moving from the farm where we’d lived for more than 40 years to a new home 300 miles to the east, in Currituck County, N.C. The book made the move, but ended up under the stack of other books waiting to be read. I wish I’d had my hands on it during the worst of the upheaval, because it’s a delightful diversion. DRAGON TEETH. By Michael Crichton. Harper. 289 pages. $28.99. Michael Crichton died in 2008, but this entertaining story is a new one. Depending on how you want to spin it, the manuscript was either serendipitously “discovered” in his files or dredged up from where it should have stayed – with the books that he didn’t have published. 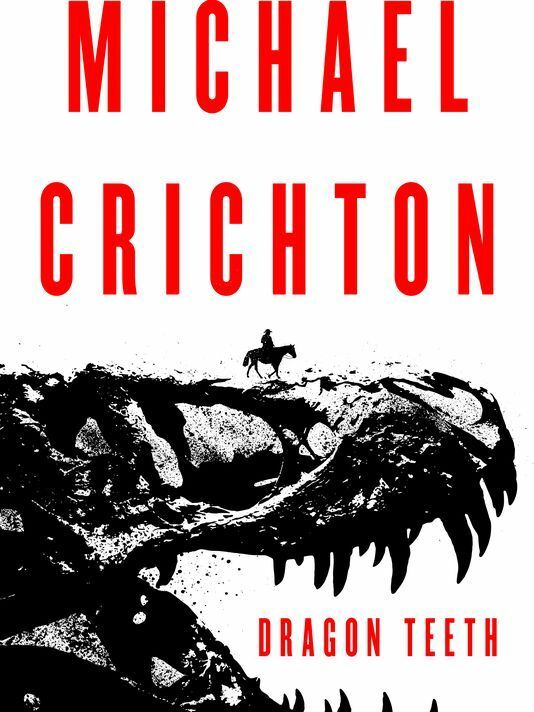 Dedicated Crichton fans have already been debating the book’s merits and how it stacks up against such Crichton blockbusters as Jurassic Park and The Andromeda Strain. As for me, a fan but not a fanatic, I’m glad this book made it into print. It was a lot of fun to read, and it included some fascinating history, especially about dinosaur discoveries as well as passionate disagreements over Darwin’s theory and the divisions between science and religion that it helped spur. The time is 1876, and the primary setting is the still-wild American West – the Dakota, Montana and Wyoming territories. Custer has just had his bloody last stand, and the Sioux are still angrily dealing with white interlopers. But the lure of gold and other sources of fortune and adventure draws more and more people to this largely lawless region. Enter William Johnson, a privileged son of a Philadelphia family who is an undergraduate at Yale. To win a bet against a fellow student, he signs up to go West with a group spending the summer helping Othniel Charles Marsh, a noted paleontologist. This is the time not only of the Indian Wars, but also of the Bone Wars, a ruthless – sometimes reckless – competition to find the best fossils in the paleontological treasure chest that was the American West. Marsh is a real historical figure, as is Edward Drinker Cope, his bitter rival. Marsh’s obsessions lead to suspicions and paranoia, and, convinced that Johnson is a spy for Cope, he abandons the inexperienced young man in Cheyenne. His summer and his honor at stake, Johnson joins Cope’s rival expedition. What ensues is a grand adventure in which the spoiled young man learns a lot, nearly loses his life more than once and does a lot of growing up. Along the way, he runs into outlaws, miners, Indians, whores, shysters and many other characters, including the famous Wyatt Earp. Will he survive, and will he keep his vow to protect the dinosaur bones that wind up in his care? Crichton cautions not to read this book as history, and he includes notes as to who is real and what happened to those figures. His story does describe much what really happened that summer in both wars – Indians and bones. Then, naturally, he weaves a dramatic and fast-paced story around those facts. This entry was posted in Action/adventure, Historical Fiction, Popular fiction and tagged Bone Wars, Dragon Teeth, Michael Crichton. Bookmark the permalink. I agree with you! I started this book having no idea what it would be about (other than the clue of the title). I had the best time reading it – there are a lot of unexpected turns.